L3 Accelerated Learning Programs are designed to get you certified and set you apart as a professional. 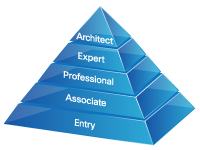 Cisco offers five levels of network certification: Entry, Associate, Professional, Expert and Architect, the highest level of accreditation within the Cisco Career Certification program. L3 Technologies offers both Entry and Associate level training courses. Occasionally, we offer Professional level certification courses. If there is not a course listed that you are interested in taking, please contact our Sales Team, at 956.429.3700 or Sales@L3Training.com for more information or for a customized quote. There are two certifications that serve as a starting point for those interested in starting a career as a networking professional: CCENT & CCT. The Associate level of Cisco Certifications can be considered the foundation level of networking certification. One can begin directly with CCNA for network installation, operations and troubleshooting or CCDA for network design. The Professional level shows an advanced level of expertise with networking skills. Each certification within this level covers a different technology to meet the needs of varying job roles. Cisco announces the redesign of the Cisco Associate-level certification programs and the evolution of the Cisco CCNA certification to the Cisco CCNA Routing and Switching certification. » Learn More. fully-certified and ready to improve your career! Should an attendee complete a Cisco Training Camp Program without having successfully passed all vendor examinations, the student may re-attend that program for a period of up to one year; free of charge. Students will only be responsible for accommodations and vendor exam fees. Looking for a free course or just some extra cash? Refer your friends to a class to get certified, and get a great referral fee. Ask one of our training consultants for more details!